Direct torque control (DTC) is one of the most excellent control strategies of torque control in induction machine. It is considered as an alternative to the field oriented control (FOC) or vector control technique. These two control strategies are different on the operation principle but their objectives are the same. They aim to control effectively the torque and flux. 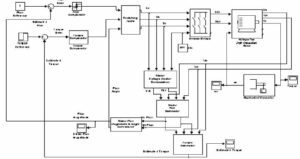 Torque control of an induction machine based on DTC strategy has been developed and a comprehensive study is present in this research. The performance of this control method has been demonstrated by simulations performed using a versatile simulation package, Matlab/Simulink. Several numerical simulations have been carried out in a steady state and transient operation on a speed control mode. The work carried out in this paper is aimed and focused to develop a direct torque control simulink model. The DTC architecture allows the independent and decoupled control of torque and stator flux. The implementation of the DTC model has been deeply described and justified its realization. In order to show the effectiveness of the model, a numerical simulation has been performed on a 7.5 kW induction machine fed by an IGBT PWM inverter. The feasibility and the validity of the developed DTC model, based on switching table technique, have been proved by simulation results obtained in the torque control mode. 1. Casadei, D., G. Gandi, G. Serra and A. Tani, 1994. Effect of flux and torque hysteresis band amplitude in direct torque control of Induction Machine. Proc. IECON’94, Bologna, Italy, 299-304. 2. Casadei, D., F. Profumo, G. Serra and A. Tani, 2002. FOC and DTC: two viable schemes for induction motors torque control. IEEE Trans. Power Electronics, 17(5): 779-787. 4. 4. Takahashi, I. and Y. Ohmori, 1989. High Performace direct torque control of induction motor. IEEE Trans. Ind. Appl. 25 (2): 257-264. 5. Vas, P., 1990. Vector Control of a.c. machines.Oxford University Press. This entry was posted in Blog and tagged 2016/2017 IEEE electrical projects for BTech/MTech, Academic electrical projects for BTech/MTech, B.Tech Final Year Projects, B.Tech Projects, best EEE projects, BTech/MTech electrical projcts, Final year electrical projects for BTech/MTech, IEEE electrical projects for BTech/MTech, IEEE Power Electronics and Drives Projects, IEEE Power Electronics Projects, IEEE power System Projects, IEEE Projects, Induction Machine, Latest 2016 IEEE Electrical Projects, Latest 2016 IEEE Power Electronics and Drives Projects, Latest 2016 IEEE Power System Projects, latest electrical projects IEEE, M.Tech Final Year Projects, M.Tech Project, Major electrical projects for BTech/MTech, MATLAB/Simulink Electrical Projects, MATLAB/SIMULINK projects for BTech/MTech, mtech power electronics projects for BTech/MTech, mtech power systems projects for BTech/MTech, Readymade electrical projects for BTech/MTech, renewable energy and systems projects for BTech/MTech, Simulink Model of Direct Torque Control, Simulink Model of Direct Torque Control of Induction Machine, topmost ieee electrical projects, wind energy projects for BTech/MTech. Bookmark the permalink.